I am always amazed by how restaurants pop up with new concepts, and one of the latest provides the diners of London with the chance to feast on a true delicacy, the Red King Crab. I am really not an expert on the fishing techniques to be able to catch what are the largest crabs, but I am reliably informed that these giants of the crab world are only found in a small section of the Arctic Ocean’s coldest and deepest waters and are very difficult to catch. I am also assured that these crabs are a prized delicacy, and the flavour makes up for all of the effort it takes to catch them. Fancy Crab is well placed on Wigmore Street, and the building oozes class from the moment you enter, with the high ceilings giving a wonderful feeling of space, and the ice bar at the back of the restaurant housing these elusive red giants which you will be enjoying during the evening. In between the ice bar and the door are simple tables and chairs, and green leather booths against the walls overlooked by an eclectic mix of modern and old paintings. Some places just have a cool vibe, and this is one of them. Our welcome was warm and we were led to our booth where we could peruse the menu over a glass of something cold. As the name suggests this is a seafood restaurant (although there are some dishes for the meat eaters, well two! ), and the selection is extensive. For the romantics a few oysters to start would be perfect, but we passed on these as we spotted some gems from the appetiser and starter section. It was a bitterly cold evening so our first choice was a warming King Crab and Lobster Bisque (£13). Generous pieces of this regal giant were engulfed by the rich bisque which also provided a hint of the sea. Our other selections were the Grilled Tiger Prawns (£12) and the King Crab Tempura (£12.50). The tiger prawns were flavoured with tamarind and honey, and the sweetness of the honey came through without overpowering the prawn, whilst the light batter gave a satisfying crunch to the sweet white claw meat accompanied by a delicate saffron aioli. Although there is a wide choice of mains and also a number of amazing Crustacean Stands packed with lots of goodies from the sea (priced from £19.50 to £100), the next decision, in my view, was a simple one, and rather than what to choose, it was how much of it would we order (Red King Crab £18/kg). The restaurant name says it all, and you are coming to taste this red ‘fancy’ giant, and when you do taste it you will see why it is so prized. The choice is really whether to have the crab on ice or baked over charcoal and we decided to respect the delicate taste and have it on ice. To accompany our crab we selected some truffle fries (£5) and some buttered spinach (£4.5), which perfectly accompanied the fresh and slightly sweet crab. Food of this quality shines in any situation, and to get the full experience and delicate flavour I recommend keeping it simple. There are other choices including a King Crab Burger (£23) and the Singapore Chilli Crab (£28) which is a firm favourite because of its contrasting sweet and spicy tastes, but to me this crab’s taste is so good it seems a crime to mask it with anything, even if it is a great sauce. It was with great disappointment that when the deserts menu was handed to me it didn’t have a King Crab Cheesecake or at least something with Red King Crab in it!! Well that wasn’t strictly true, and I was delighted to be able to pick the Chocolate Fondant (£7.5) and my wife picked the Fancy Lemon Tart (£6.5). The chocolate fondant ticks every chocoholic’s dreams, and the deconstructed lemon meringue was tangy and zesty and provided a palate cleanser to end the meal. Crab needs to be treated with respect to enable the diner to get the full benefit of its texture and slightly sweet taste, and now there is somewhere in London where you can experience this to the full. In my quieter moments I sometimes ponder over why things are named the way they are. Why was chocolate named chocolate, why an apple and not something else, and so when presented with a restaurant named Wild Honey my interest was piqued. Is it owned by a fan of the Beach Boys (Wild Honey was their 13th Album), a fan of Checkov (a play based on a Checkov untitled piece), or are they just a lover of an organic sweet sticky substance? Having visited Wild Honey I am unsure it matters, as this is a restaurant with a name that will be ingrained on your memory, not for any other reason than its quality and amazing value. 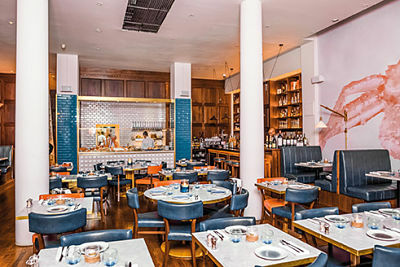 Wild Honey is owned by celebrated chef Anthony Demetre, and is the sister restaurant to the multi award-winning Arbutus. It was opened in 2007, and since then has continued to wow restaurant goers with its contemporary European menu made with wonderfully fresh and seasonal English ingredients (a European collaboration that both ‘remainers’ and ‘brexiteers’ would approve of!). Wild Honey is well located just off New Bond Street, near to Hannover Square just across the road from St Georges Church, and its discrete entrance leads you to a wonderfully proportioned oak panelled room which has an upmarket members club feel to it. Art Deco chandeliers look down on you, and on one side there is a marble counter where you can sample inventive cocktails and on the other red banquettes and crisp white tablecloths. There is a sophisticated elegance about the place that is welcoming and immediately makes you feel at ease. We were warmly welcomed by the staff and taken to our table where, whilst scanning the menu, we nibbled on fresh white and brown sour dough bread, whilst deciding between the set 4-course menu for £39 or the treats on the à la carte menu. Although the set menu offered incredible value, there were a few dishes which I truly had to try, so we plumped for the à la carte, but either way I doubt we would have been disappointed. There were 6 starters to choose from, and it is rare for me to say that I could have chosen any of them, as the creamy Burrata, crushed autumn Delicia squash, Brogdale pears and candied walnuts (£12) was nearly my choice, but instead we chose the Hare Ragu with fresh hand cut macaroni, olive oil and parmesan (£12), and the Grilled Sardines, wood roasted sweet pepper salsa (£9). I always have a soft spot for sardines as they are my Dad’s favourite, and they were a great tribute to one of his most loved dishes as the sardine skin was wonderfully chargrilled, and the bones I always remembered as a child, had all been removed, so I was left with crispy skin, oily fish and a robust salsa - my kind of heaven. The Hare Ragu was rich and truly gamey and the generous chunks of hare were moist and tender, and the macaroni slightly crunchy, creating a wonderful dish. The mains selection is again a choice of 6 options, and once more I genuinely could have chosen any of them, so it was a really difficult choice. Despite the lure of venison and cod, I selected the Denbighshire Lamb, rump and slow cooked breast, grilled hispi cabbage and green vinaigrette (£24), and my wife selected the Ricotta Dumplings ‘Grundi’, Delicia pumpkin, olive oil and parmesan (£17). People think that dishes like lamb are simple to cook, but a meat as delicate as lamb needs tender loving care and this lamb was cared for very well! The meat was pink and just melted in my mouth. My wife’s ricotta dumplings were again a true delight, and the Delicia pumpkin treatment enhanced the sweetness of the pumpkin and that clash/marriage with the intense parmesan cheesy flavour made a dish that could convert me to vegetarianism, such was the intensity of the flavours. Portion size is generous so we didn’t take up the optional cheese course (£14) as we wanted to leave room for dessert, and we were truly grateful we did. A number of restaurants have a signature dessert which is more hype than substance, but here that is not the case as the classic Tarte Tatin of apples is truly a must (£20 but serves up to 4 people). I still don’t know why apples are named apples, but when they are perfectly cooked, encased in moist layers of flaky pastry and covered in a rich caramel sauce I frankly stop caring and just delight in the explosion of tastes in my mouth! This is a masterpiece, so please leave room for it, as you will kick yourself if you don’t, although the honeycomb ice cream we also picked was also worthy of note. Service is of the highest standard with highly trained staff attending to the guest’s every need, while a concise and eclectic wine list is available by bottle or by carafe, allowing visitors to try a range of different labels without breaking the bank. The selection of wines is extensive and with the option of selecting wines by the carafe rather than bottle you can select wines for each course which helps when your wine choice differs from your partner’s. 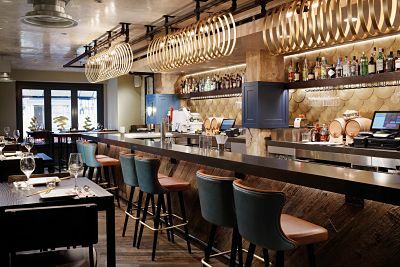 Wild Honey have thought of everything, from a wine dilemma to what food to choose, and this is all done in stylish surroundings with attentive but not pushy staff and I love it. Eating out should be an experience far more than just the food (although this is crucial), and Wild Honey delivers in spades, and for £39 for 4 courses in the heart of Mayfair this is really a steal. Sometimes only steak will do, and for those times there is Smith & Wollensky. 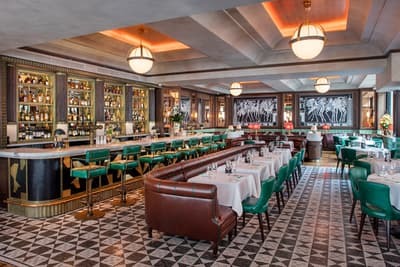 The New York Times described it as “A steakhouse to end all arguments”, and this US steakhouse has certainly enjoyed a triumphant expansion, from its original flagship premises in New York (opened in 1977), across the US and now into the heart of London, where it opened its’ first UK steakhouse in 2015. 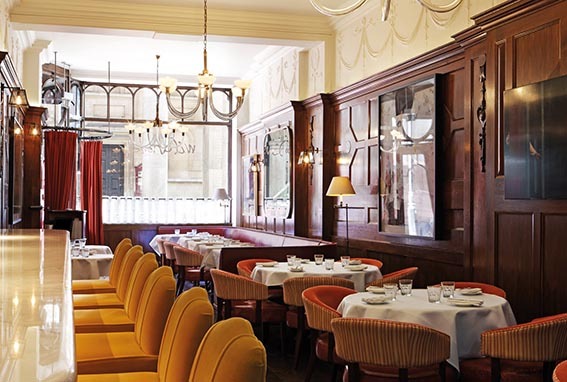 In keeping with a brand which has become known for its elegant dining rooms in intimate or iconic locations, the London steakhouse is no exception. Located in the monumental art deco styled Adelphi Building, situated between the Strand and the Thames, it forms part of the London Skyline as you cross Waterloo Bridge. Former residents of the Adelphi building have included JM Barrie (author of Peter Pan), George Bernard Shaw and Thomas Hardy, all notable in their fields, as Smith & Wollensky are in theirs. It is interesting to note that ‘Smith & Wollensky’ was founded by Alan Stillman (creator of TGI Friday) and Ben Benson. You may be wondering, as I was, how they happened upon the name. In fact, the story goes that “Smith” and “Wollensky” were names selected at random from a New York phone book, late one night! One thing that hasn’t changed is the style, quality and service that were present then, and the attention to detail. As you slip from the hustle and bustle of the Strand with its’ theatres and shops, into John Adam Street, you seem to not only leave the crowds, but also to step back in time. This feeling is perfectly evoked by the Martin Brudnizki designed interior, decked in mahogany. The ceilings are high and the space extensive (15,000 square feet), but the clever interiors manage to still create a feeling of intimacy. The art deco features are impressive; from the lighting and patterned floor tiles to the wall art and furnishings - there is a wonderful feeling of being in 1920s New York. On entering, my wife and I made our way past well-spaced out tables and booths to the bar, where we relaxed with a cocktail whilst perusing the menu. There is a fantastic range of speciality cocktails, and I enjoyed my Scorpion (rum based) whilst my wife sipped her Greenhouse Gimlet (gin based). There are also American- sized (80ml) Martinis and Manhattans available – next time! We were shown to our booth by a waiter dressed in a pristine white jacket, where we knuckled down to the serious job of choosing our dinner. The starter choice is extensive and is mainly dominated by seafood including Tuna Ceviche (£9), Seared Chilli & Garlic Shrimp (£14) and Octopus & Chorizo Carpaccio (£16), with Fillet of Beef and Chop. My wife chose the Hand-Dived Scottish Scallops with Garlic & Parsley Butter (£19), and I selected the Half Cold Poached Lobster (£16). If you really want a feast then you should look no further than the two sharing platters which consist of a tower of Lobster, Jumbo Lump Crabmeat, Jumbo Shrimp, Pyefleet Pure Oysters & Cherry Stone Clams paired with Classic Cocktail Sauce, Cognac Mustard Sauce, Ginger Sauce and Sherry Migonette, priced at £90 for the ‘Charlie Smith’ (2-4 people), or £125 for the ‘Ralph Wollensky’ (4-6 people). The mains are unashamedly dominated by steak, (well it is a steakhouse!) but for the sake of variety, there are options including burger, fish, lobster, chicken, salad and pork chop. Let’s be honest, it’s the steak that holds the headlines here. There is an enormous amount of knowledge and pride amongst the staff when it comes to the steaks. 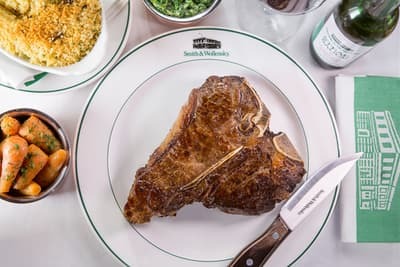 The meat is butchered and dry-aged on-site, and is hand-cut in their in-house butchery by their own butcher; making it the only steakhouse in London which offers a cut of meat that combines all three. Sitting alongside the American steaks are patriotic British and Irish cuts and premium seafood together with locally-sourced ingredients from the very best UK suppliers. All of this is enhanced through a careful dry-ageing process lasting 28 days which intensifies the flavour and tenderness. I went for the USDA Prime Sirloin (250g, £36) as I just love the rich flavour. My steak was chargrilled to perfection and served with a Béarnaise Sauce. There is an impressive selection of enhancements and sauces to choose from including rubs, crusts and even lobster tail. Other cuts include the Chateaubriand 600g (£80; to share), T-Bone 500g (£58) or a Kansas City Cut Bone-In Sirloin (£64). My wife had the Seared Tuna (£26), which was served with a cauliflower couscous, and complemented with a citrus dressing. To accompany our mains, we ordered French Fries (£5), Creamed Spinach (£10) – for me a must- have with steak - Onion Rings (£7) and Truffled Mac ‘n’ Cheese (£10). There is a comprehensive wine list, including Smith and Wollensky’s own Private Reserve from California available as Sauvignon Blanc and Red Blend. On this particular evening, we enjoyed the house Californian wine. Prices per glass range from £5.25 (125ml) for a Chardonnay Blend to £12.50 (125ml) for the Private Reserve Red Blend from Napa. From a previous visit, I remembered not to eat too much before coming here and I advise you to do the same, as the portions are American size, not UK. That said, when the dessert menu arrived, I suffered from an immediate case of ‘eyes bigger than belly’. Smith & Wollensky do not do things by halves and have their own pastry chef who prepares the desserts daily on site. I opted for the Gigantic Chocolate Cake (£18) which truly lives up to its name. This can be shared between up to 4 people and consists of moist chocolate layers of cake brushed with Baileys Irish Cream, sandwiched with chocolate mousse and covered with chocolate ganache. This was my kind of pudding, with the cake being light in texture and the mousse suitably gooey, but even with my love of chocolate, there was not even the smallest chance of finishing this gargantuan slice of cake, and some days later I was still to be found carving off slithers from my fridge at home (they are used to requests for a doggy-bag!). My wife, in addition to sampling the cake, opted for cheese and biscuits from the cheese trolley (£14) and enjoyed some fantastic British cheeses. Smith & Wollensky’s stylish dining room is split over two levels, each with a separate bar, meaning they are well equipped to cater for large private parties. If your party is more compact in size, there are 3 additional private dining rooms for those special occasions. With such large and versatile dining space at their fingertips it’s great to see that they run a range of special events including Thanksgiving and 4th July celebrations along with Wine Events. Keep your eye on their website www. smithandwollensky.co.uk to find out details of these and other events throughout the year. Smith & Wollensky offers a timeless, vibrant, yet relaxed atmosphere that envelopes guests in gracious hospitality. It takes many of the features of the Adelphi Building and its art deco style and marries them with the distinctive Smith & Wollensky brand, the result of which is a dining experience that offers simple refinement in the grand tradition and justifies their claim of offering the “best steak in London”. I am not sure my waistband agrees! Hopefully you are as intrigued as we were by the rather grand title given to this wine and tasting menu experience created by the Vineyard Hotel in Berkshire. 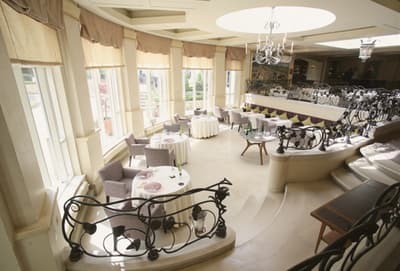 First things first, whilst the Vineyard Hotel does not sit amongst its own vines, (surrounded instead by the Berkshire countryside), it does hold some 30,000 bottles in an extraordinary glass cellar that is visible from the floor of the hotel’s reception. In addition, the hotel owner Sir Peter Michael is a rather big name in wine production, having his own vineyard in California, from where many of his award- winning wines have been imported to the hotel. Wine is a huge focus for the hotel, and ‘The Judgement of Paris’ as we found out, was an important event in the wine world that had such lasting influence, it has been recreated here as a fun and enormously enjoyable challenge to anyone that enjoys a glass of wine – however, lacking in wine knowledge you may be (and we are as it turns out!). The Judgement of Paris (or the Paris Wine Tasting of May 24 1976) is seen as one of the most pivotal moments in wine history. A blind wine tasting of French and Californian wines, nearly forty years ago, that forever changed the future of winemaking, when unknown Californian wines were chosen over some of France’s finest by some of France’s top wine aficionados. Organised by British wine merchant Steven Spurrier, excellent Californian Chardonnays and Cabernet Sauvignons were tasted alongside white Burgundies and Bordeaux reds. For Californian winemakers, and for winemakers around the world, the event transformed the industry. Those in attendance included journalists Odette Kahn: the editor of ‘La Revue du Vin de France’, and George M. Taber from Time Magazine who later wrote a book about the event. Years later, in 2008, a comedy drama film; Bottle Shock starring Alan Rickman, was released which tells the story of The Judgement of Paris. Indeed, the final result of this event was so shocking that some of the judges withdrew their ballots. From then on Sir Peter Michael, owner of The Vineyard, was inspired. The Paris tasting set him on a journey to California in search of a suitable vineyard location, which he found in 1982 starting the Peter Michael Winery in Knights Valley, Sonoma. In 1998, he opened the five-star Vineyard hotel in Berkshire, now established as the UK’s leading wine hotel. Here, amongst some 3,000 bins in the Vineyard’s wine cellar, are over 800 Californian wines including a unique collection from Peter Michael’s own vineyard. The story of the Paris tasting lives on at the Vineyard. The hotel’s impressive art collection includes a huge canvas of the legendary 1976 ‘Judgement of Paris’ (not to be confused with the 17th century works of Art by Rubens of the same name) commissioned by Sir Peter in honour of the event. Steven Spurrier himself (the organiser of the original Paris tasting) was invited to The Vineyard to unveil the extraordinary work of art in May 2012. The ‘Judgement of Paris’ wine tasting experience invites guests to recreate their very own blind tasting with wines matched to each of seven delicious courses prepared by British chef Robby Jenks. Traditionally, a French and Californian glass are served with each course and the diner decides which they prefer, along with a few guessing games. The tasting also includes two blind taste tests served in blackened glasses, the diners’ task being to guess the variety of grape, along with the origin - California or France? You’ll pick up clues and tips from the Sommelier along the way, helping you to make your best educated guesses - although where we were concerned we still only managed to successfully guess the origin of two of the wines! At the end of the dinner, guests raise a glass to California or to France. Which one gets your vote? With so many delicious wines to taste you may think that the food would be overshadowed, but you would be quite wrong. The tasting menus are carefully constructed with each new season, using the highest quality, locally sourced ingredients. Chef Jenks aims to provide a ‘gastronomic experience’ and in our humble opinion, succeeds in doing just this. The food we were served was so memorable, it had us reminiscing for days afterwards. You may feel, as I have done in the past, a certain wariness when approaching a tasting menu - the element of choice has been all but removed, and the decisions are in someone else’s hands, which results in sampling dishes you may never have otherwise discovered. This can go one of two ways: you will either end up cleaning your plate and wanting more, or being glad that the portion is small! The menu we sampled on a wet, cold late November evening included such dishes as Loch Duart Salmon with beetroots, walnut and wasabi, Pan-fried Foie Gras with grape, hazelnut and pain d’epices and Venison Loin with blackberries, parsnip and cabbage and bacon. Each of these dishes was impeccably presented. The quality of the ingredients and high standard of cuisine was consistently apparent across all the dishes - with the result that our plates were clean after each and every course. My personal favourite was the Venison Loin, which definitely fell into the category of a dish I would never have otherwise discovered. The meat was perfectly tender and beautifully complemented by the flavour combination of blackberry, parsnip and bacon - it really was a delight to eat, and a complete surprise to me, as I have never particularly enjoyed venison in the past. My partner’s dish of choice was the Pan- Fried Foie Gras which he couldn’t help making satisfied noises over for the (short) duration of eating. He kept urging me to sample it, as I had chosen to substitute this dish for the hand- dived scallop with celeriac, truffle and apple. The pre-dessert served as a palate cleanser, but was so much more than that with its classic combination of lime, coconut, pineapple and basil. The dessert itself made quite an impression with its decoration of long shards of spun sugar adorning the salted caramel, manjari (Madagascan chocolate) tonka bean and coffee concoction. A delicious way to finish a wonderful meal. Of course, the flavour and texture of the food is enhanced at every course by the wine pairings served alongside, and it must be this fusion of good wine, good food and good fun that makes ‘The Judgement of Paris’ a memorable experience rather than simply a great meal in a nice hotel. You may even come away having learnt a thing or two about wine - here’s hoping! The Vineyard is a destination, and not just for the wine buffs among you. The hotel’s facilities include an award-winning spa, 49 suites and rooms and an impressive private art collection - so there is every reason to make the journey to Berkshire to experience it for yourself - if the promise of award winning wines and 3AA rosette standard food were not enough. Just near to the heart of London is the first UK restaurant of the US chain PF Chang. The location is a former jazz club on the edge of Chinatown and has been designed like an upmarket New York restaurant with exposed pipes zigzagging the roof overlooking a large bar occupying the lefthand side of the room and high tables on the right. A little further down the restaurant there are lower tables for a more romantic meal, and at the end there is a spacious open kitchen where the chefs buzz around weaving their magic. We visited on a Wednesday night and despite it being early in the evening the bar, high tables and lower tables were full of people and there was a lively buzz of people having a good time. We were led to our table and once seated selected a cocktail from their ‘Bar Lab’ whilst perusing the menus. PF Chang prides itself on the quality of its ingredients and that it is sourced locally and the selection makes choices difficult. We started with a PF Chang special the Original Dynamite Shrimp (£13.5), which is described as ‘always imitated, never duplicated’ and is a very generous portion of crispy tempura battered shrimps, spicy Sriracha aioli and spring onions, served in a cocktail glass. The prawns were fresh and smothered in a lightly spiced sauce and it took all my restraint not to order another one! I can’t imagine how many they produce each evening, as we saw cocktail glass after cocktail glass pass our table throughout the evening, so I am sure the reputation of how good this dish is has got around! We followed this up with the Original Chang’s Chicken Lettuce Wraps (£9.5) where you take the finely diced rich wok fried chicken, mushrooms, spring onions and water chestnuts and wrap them in lettuce cups to form a healthy pancake. The chicken and mushrooms are well seasoned and the spring onion gives some texture and it is lovely that something so healthy tastes good as well. The next stop on our journey through the menu led us to the indulgent Handmade Lobster and Shrimp Spring Roll (£14.5) where the sweetest lobster claw and knuckle meat, shrimp and chives are lovingly hand rolled and fried. This is all served with a lightly spiced Thai curry aioli. The batter was light and crisp offsetting the soft lobster and crab and the aioli was delicate enough to enhance rather than smother the lobster and crab flavour. I am now a convertee to sushi and I would recommend the Black Truffle Rainbow Sushi Roll (£10.5) and the Dragon Roll (£9.25). Both are special, and the strong flavours of tuna and salmon encased in perfectly sticky rice was a delight to our taste buds. After a pause to enjoy our surroundings and a lovely fruity South African Chenin Blanc (£29), we tackled the mains and finally selected the Mongolian Beef (£11.5), rich and tender chunks of Flank Steak caramelised with their signature dark soy sauce and garlic served with spring onion, and the Kung Pao Chicken (£10.5) along with fried rice (£5.25) and Wok Seared Tempura Cauliflower (£4.25), which although being really tasty, was slightly disappointing as it wasn’t in batter which I would expect a tempura to be. The Mongolian Beef was rich and succulent and the Kung Pao sauce nicely piquant without being overpowering. PF Chang has its own pastry kitchen downstairs (they call it a pastry lab) and it was this kitchen that created our desserts. It is unusual to have such a specialised kitchen but the results are proof that more should as my dessert, the White Chocolate Bomb (£7) was lovely, but my wife’s selection of the deconstructed Lemon Meringue (£6) was spectacular. I am of the opinion that there are too many chefs that deconstruct classic dishes just for the sake of it, and unless the ‘deconstruction’ improves the dish it shouldn’t be done. In this case the deconstruction truly improved the dish and the two types of meringue one soft one crunchy, the balls of lemon ice cream, shortbread, white chocolate and popping candy just danced over our taste buds. We couldn’t tell the staff enough times how delicious we thought the dish was! PF Chang offers quality food in a modern stylish environment right in the heart of London, and for lovers of Asian food we highly recommend the restaurant - don’t forget to leave room for the desserts as they are worth the visit alone.